Another first for eThekwini - As part of the Durban Solar City Framework to stimulate PV uptake, the Durban Solar Map allows residents to calculate the financial viability of a PV installation on their roof. The eThekwini Municipality’s Energy Office is involved in a plethora of Renewable Energy projects, such as the Energy Office Solar (EOS) Project – the installation of PV on eThekwini Municipal owned roofs - and Wind re-powering – the installation of wind turbines within eThekwini Municipality. 4. Educating and empowering residents. 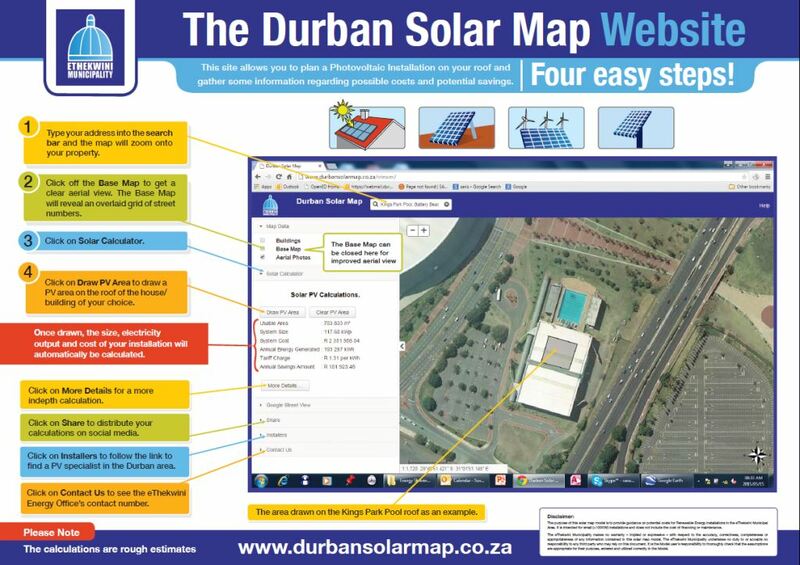 A key component of Educating and empowering residents is the Durban Solar Map which is a web-based interactive tool that allows residents to calculate the financial viability of a PV installation on their roof based on solar irradiation and other data. The process to utilise the map is fairly simple, all residents need to do is to enter their property address, identify their specific property and draw on their roof the specific area they want to install PV (ideally north facing). Basic technical and financial information will automatically be calculated based on the area drawn. It is important to note that this tool will only work within the eThekwini Municipal Area. However the underlying programme can be easily adapted by other Municipalities in South Africa.